The development of crisis resistant / resilient cities is the key factor for sustainable development. In the events of crises or hazards (natural hazards such as floods or climate related heat waves and drought as well as societal extreme events as a financial crises or refugee influx), cities should be able to fulfil their societal and economic duties in the long term. In many cities the question arises how and with which measures the resilience can be increased as well as how strategies for successful sustainable urban development can be implemented – especially taking the shortages of public funds into consideration. Yet, preventive measures are long-term investments which have to compete with current problems and restricted funds, which is why they are not often implemented. 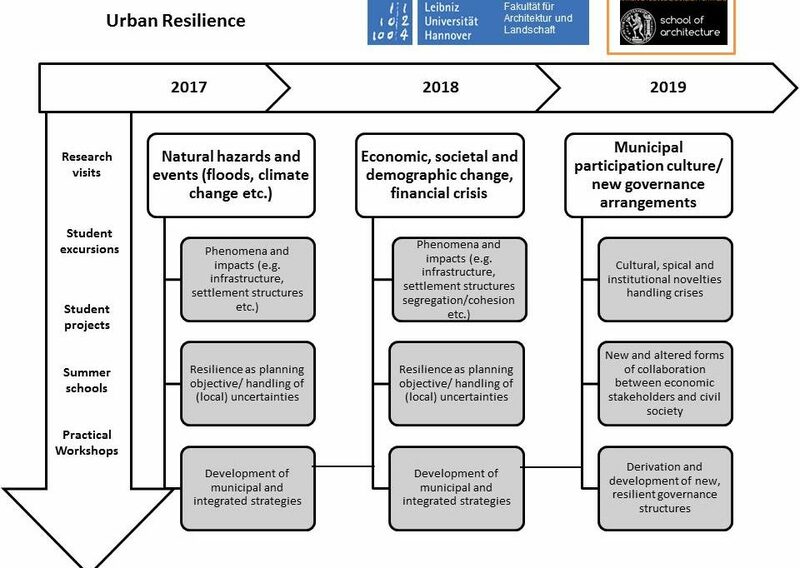 Hence, the opportunities of developing resilient cities are frequently not used, risking that similar measures will be more time-consuming and costly at a later point. The project picks up and works with these challenges. Joint research and teaching units aim at (1) understanding the challenges for sustainable and resilient urban development in German and Greek cities, (2) analysing the planning steering mechanisms and instruments, and (3) developing corresponding strategies and measures for the implementation as well as analysing their transferability to other contexts. Which challenges do cities face regarding economic, social and demographic challenges as well as the financial crisis? 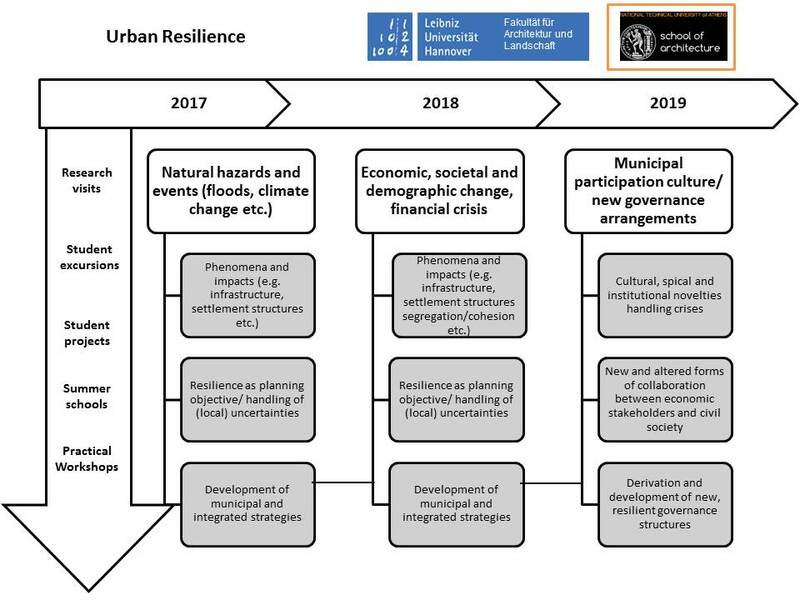 What characterizes a crisis resistant / resilient city? How can administration, civil society and economic actors commonly contribute to establishing and implementing resilience? In the course of the DAAD University Partnership between the LUH and the NTUA various, complementing measures and formats are put into practice in order to foster the exchange of research and practice in strategies of sustainable urban development. The formats include summer schools, excursions and workshops and involve different target group of different constellations (Bachelor and Master students, PhD candidates, Post-docs and professors).